Santorini is largely known for its signature attractive white houses, solid rocks and stunning Aegean Sea views. Those who visit the island will love the beaches, the volcanic landscape and the local character. But Santorini is also known for its indigenous grape varietal, the Assyrtiko and its PDO Santorini named wine when bottled on the island. The archeological evidence supporting the cultivation of the vine on Santorini dates back almost 5,000 years. The eruption of around 1600 B.C. made the unique wines of Santorini what they are today. The explosion left behind a mixture of volcanic ash, pumice stone and pieces of solidified lava and sand, which together make up the soil of Santorini, known as "aspa." The soil has little-to-no organic matter, but is rich in essential minerals creating wines with a naturally low pH level and high acidity. The vineyard of Santorini is believed to be the worlds oldest but the actual age of the vines is under debate. The vines are grown in the "koulara" method, which means they are woven into continuous circles to form a basket for protection from the strong winds and harsh summer sun. Naturally resistant to most diseases and its volcanic character explains its popularity throughout Greece. It makes up 70% of the vineyards of Santorini and due to the high levels of alcohol and acidity possesses long aging potential. 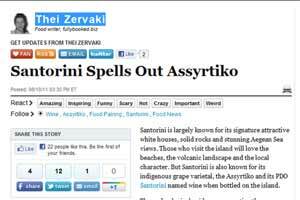 But Assyrtiko is not for everyone. If you prefer the fruity and aromatic lightness of Sauvignon Blanc, Assyrtiko may taste too mineral or too acid. And if the crispy Chardonnay is one of your favorites, Assyrtiko citrus aromas may be overwhelming. But it is the earthy and citrus character and its minerality that make Assyrtiko grape unique. Bold, with personality and complexity, Santorini wine has become one of the most sophisticated wines in the world. Athiri and Aidani are the other two native grape varietals of the island. Often blended with Assyrtiko, they give dry and pleasing white wines. They are also used to make Vinsanto, the sweet wine. There are plenty of wineries on the island, producing in total around 1 million bottles a year. For a lighter taste and plenty of aromas, try the Sigalas Santorini 2010. If you want higher minerality, the GAIA Thalassitis 2010 will be ideal; Gavalas Santorini 2009 has strong citrus aromas and earthiness. If you are looking for structure and prune like aromas, Sigalas 2006 will do the job. On the other hand, Hadzidakis Nykteri 2009 is an oaky Assyrtiko wine which has been in French Oak for 8-9 months, therefore is slightly heavier but still pleasing. And if you prefer a citrus taste from a 20% fermented wine in New French Oak, try the Estate Argyros 2009. It will not disappoint you. Elegant and mineral, Assyrtiko pairs perfectly with grilled sea food like shrimp, muscles and squid. It is not a coincidence that is now found in numerous Japanese restaurants providing the ideal match with sushi. It is also a very good choice with spicy dishes of Thai cuisine due to its lower intensity. And if you desire to experience Santorini fully, visit the island in person. The simplicity of the white houses, the authentic food and the stunning Aegean Sea will make you happy. Together with a chilled glass of Assyrtiko.